One of the many historical and geografically correct maps I have made. 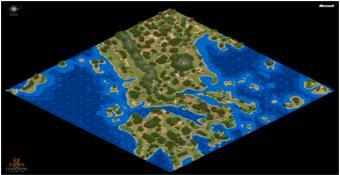 Again, it has some islands that have been moved to more convenient locations, to improve gameplay. For the same reason, I've added a small part of Italy. This map is about Ancient Greece, where eight Greek or Barbarian factions struggle for the supremacy of Hellas. The three big cities (Athens, Sparta and Corinth) start with more resources, but are bound to be fighting each other. The more isolated civilizations, like the Macedonians or the Illyrians, start with less resources, and are surrounded by harsh nature. Fish is plentiful around the many Greek isles. No triggers, I'll have to improve some things such as resource placement and perhaps minor balancing. I'm using the 'All roads lead to Rome mod', which explains why every Greek faction is set to 'Teutons' (they are replaced by Greeks in the mod). Suggestions are always welcome, I hope you'll enjoy!